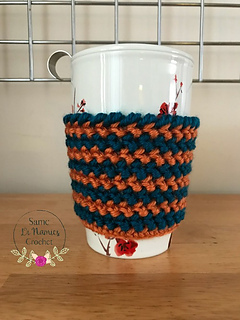 With this cozy, you’ll keep your hands from getting burned or getting too cold while drinking tea or coffee, and while eating ice cream in a pint. Make your own unique cozy with lots of colors choices. You can go solid or stripe. You can also make your cozy taller. The choice is yours! Best of all, this is a great stash busting project where you only need a few yards of yarn to make this fun cozy. It also works up super quick! Yarn - #4 Worsted Weight Yarn in any color, acrylic or cotton works well. You only need a few yards. Great for stash busting. Notions - scissors, a needle for weaving in ends. Herringbone half double crochet (Hhdc) – YO, insert hook into st, pull up yarn, (3 loops on hook), pull yarn through first loop (2 loops on hook), YO, pull yarn through the 2 remaining loops. Ch1 does not equal a stitch. Place your sc and hdc in the same st. When joining, skip the ch1 and join to the top of the sc or hdc with a sl st.
Do your color changes when joining, and alternate colors as you’d like. Carry up your color to make it easier to pick up for next rounds. 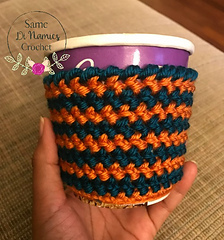 Pattern is written for both mug cozy and ice cream pint cozy. Ice cream pint cozy instructions are in parenthesis (). You can make your cozy taller. Just add extra rounds than suggested in the pattern.